Ash's oldest friends are coming back to the Pokemon anime series. 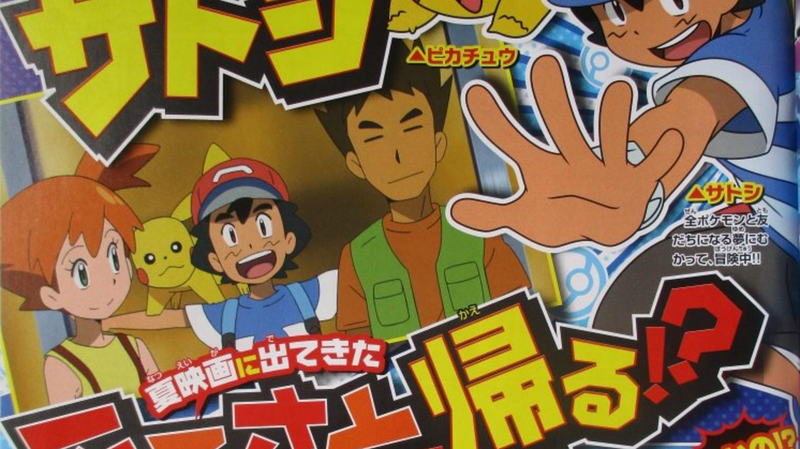 A Japanese magazine has revealed that Ash will reunite with Brock and Misty for a two episode arc set in the Kanto region. According to Serebii.net, Ash will return to his home Kanto region for two episodes that will air in September as part of a school project. After visiting his old Pokemon at Professor Oak's lab, Ash meets up with his old friends Brock and Misty and eventually battles their strongest Pokemon Gyarados and Steelix. Interestingly, both Brock and Misty have picked up Mega Rings since they last appeared in the anime, as both Steelix and Gyarados now have the ability to mega evolve. It's hard to believe that the Pokemon anime is bringing back Ash's oldest friends, as they haven't been seen or even really referenced in the anime in years. Misty left Brock and Ash after they finished traveling through the Johto region, while Brock finally parted ways with Ash after journeying through the Sinnoh region. For a while, the Pokemon anime at least kept tabs on both of Ash's friends. Misty was shown leading the Cerulean City gym in a special side episode that aired back in 2006, while Brock was training to become a Pokemon doctor in the Johto region shortly before the start of Pokemon XY: The Series. However, references to both characters dropped off as the anime seemed to distance itself from Ash's lengthy past adventures. That doesn't mean the characters were totally forgotten, though. Both characters have appeared in various flashbacks, usually showing Ash's relationship with other Pokemon. Pokemon Sun and Moon: The Series also cleverly referenced Brock and some of Ash's other friends in past episodes, as Team Rocket was selling wigs based on Brock's haircut as an Easter egg. Brock and Misty's reappearance also answers the question as to whether the characters were "erased" from continuity all together. The most recent Pokemon movie revisited Ash and Pikachu's early adventures together, but replaced Brock and Misty with two new characters created just for the movie. Brock and Misty (along with Ash's other companions throughout the years) made a brief cameo appearance during the credits, but many websites played up the character's absences as if they were totally erased from the movies. What we don't know is whether any of Ash's other friends will return for the series. Although the magazine mentioned that Ash will at least visit some of his old Pokemon at Professor Oak's lab, it's unclear if we'll actually see Bulbasaur, Charizard, Snorlax, or any of Ash's many other Pokemon during the two episode arc. Brock and Misty were Ash's first companions and helped set the tone for the entire Pokemon series. For decades, the anime followed the basic structure of Ash traveling through a region accompanied by at least one gym leader and one female character from the most recent games. Although Brock and Ash travelled together for years, Ash has also traveled with gym leaders from other regions too, each of whom were inspired by Ash to follow their aspirations outside of Pokemon battling. Although Ash has spent the last twenty years traveling around the Pokemon world, the latest anime has broken that tradition by enrolling Ash in a Pokemon school in the tropical Alola region. Many episodes show Ash and his Pokemon staying at home as opposed to spending countless nights camping out in the wild. Instead of a small group of companions, Ash's friends in the latest series in a small classroom consisting of Trial Leaders from Pokemon Sun and Moon.